We’ve done our best to build a really solid product, but with software development, bugs and issues are just a fact of life. No matter how much we test and check, we just can’t predict every possible use case, hosting setup, or potential conflicts with other plugins and themes. 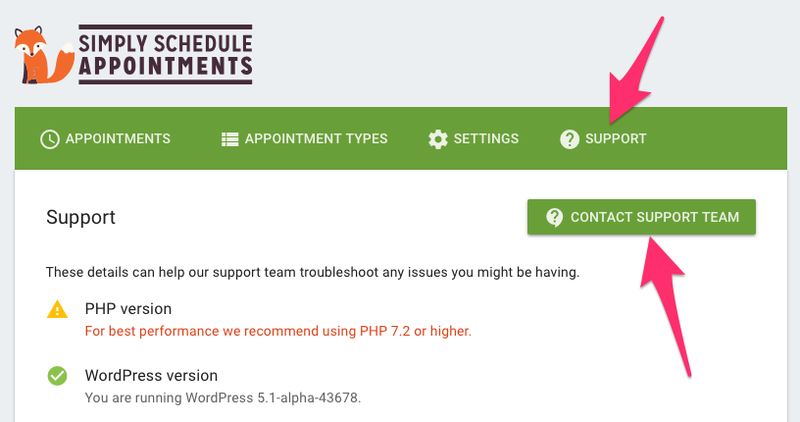 When one of our customers is having trouble with our plugin, we spend a lot of time getting details about their site, their WordPress settings, their hosting, and their Simply Schedule Appointment settings. It can make support slower and more cumbersome than it needs to be – when someone has an issue, we want to be able to jump right into helping rather than spending time getting the information we need to solve the problem. 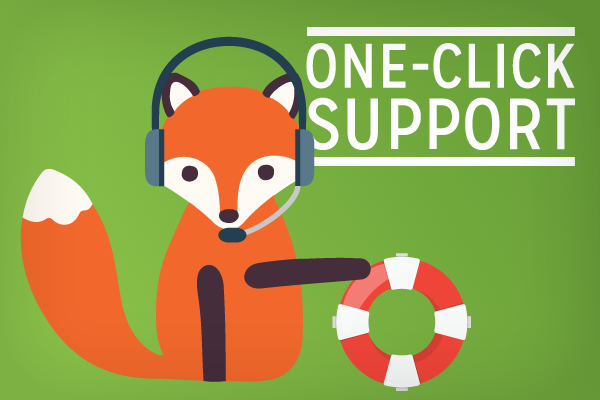 So, we’ve introduced One-Click Support, built right into Simply Schedule Appointments! If you’re having a problem and need to get in touch, just head to the Support tab. There you’ll see some general checks that could help point the way to why you’re having issues. If you don’t see anything there that helps you figure things out, click the Contact Support Team button. A new message to us will open up where you can tell us about the issue you’re having – your message will automatically include important information about your setup and browser that will help us solve your problem faster. Dealing with availability and timezones is tricky, so getting this information up front can save dozens of back and forth messages trying to clarify what’s going on. 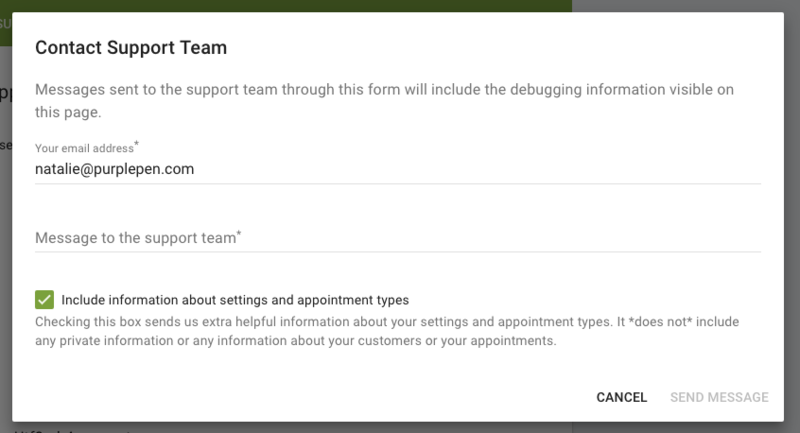 We’ve included an optional checkbox where you can send us even more information about your appointment types and some general Simply Schedule Appointments settings which can help us get to the issue even more quickly. We hope that this will reduce frustration and speed up our support process, making it easier and quicker for us to get your issue sorted out and you up and running in as short a time as possible. Our plugin was designed to save you time and make life easier, after all, so we thought our support should, too. 1-Click Support is available for all SSA tiers.